An apple has a tough time competing with a bag of Doritos. There is no sparkly bag to reach out and grab you. How do you turn your apple snack into an appealing treat? I know you are thinking that you don't need another gadget to clutter up your kitchen drawer. So, don't keep it in your drawer. Use it EVERY day and keep it next to your toaster. AND, you can make the ultimate of healthy snacks - apple and peanut butter. People ask Snack Girl all the time, "What is your favorite snack?". Apple and peanut butter ALWAYS wins. As long as I can get a fresh apple (my favorite is Granny Smith) then I am in heaven. My kids adore this slicer because they can "make" their own snacks. Buy the OXO one featured below because it is soft enough for their little hands. They will grab the slicer, go get the apple out of the fridge and feel happy about their accomplishment. Bring a slicer to work with you and a jar of your favorite peanut butter. If you keep a slicer at work, you don't have to worry about your apple slices turning brown. What do you serve with your apple slices? Great idea! I thought I had one at my desk, but can't find it so I need to get one. Makes it SO much easier as you said! Also, I just wanted to update that after switching from Jif to Peanut Butter and Co to plain peanut butter in the past year or so, I had a little "taste" of Jif yesterday. It is entirely TOO SWEET! I am so glad I am a proud switcher to plain peanut butter! @Jaime - so glad that you made the switch! The real stuff tastes better doesn't it? Yes it does! If only I could get my husband to make the switch too. He refuses. I have a corer, my 2 young boys love seeing a Hole in their apple. It also gives them somewhere to grab it. This is one of my favorite snacks too and my children love it as well. Even my 11 year old loves apples and peanut butter. Sometimes we'll mix it up and have thin sliced sharp cheddar with the apples too yum! And Snack girl is right about Granny Smith's....they are the BEST! I've been using this gadget for years--love it! I used to hate apples, mainly because when i bite into an apple, it hurts my gum (too hard) AND the peel area cuts and irritates into the corner of my mouth. i could never figure out why people (particularly my dad) love apples so much...until i learned to CUT it lol. I'm such a fan of the fruit-and-nut butter combo. Delicious and nutritious! 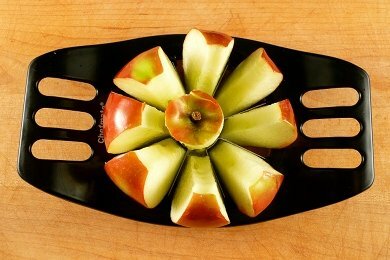 We love our apple slicer!! It's one gadget that is used regularly in our home! My daughter is allergic to Peanut butter but she loves Fruit and thin sliced cheddar!!! I've been debating on whether to get an apple slicer or not. I couldn't decide whether it would be the most useful tool ever or more drawer clutter. I'm definitely getting one now, thanks. You can pick these up at IKEA as well - they cost even less (though would still be worth it at the price listed)- they are so handy. It's great to ditch those partially hydrogenated oils too! 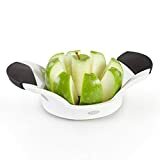 About 3 weeks ago I earned a free apple slicer at a Pampered Chef Party and am I ever happy I did. An apple a day has become my family's new mantra. I'm new to this site, but I use PB2 to make a much lower calorie peanut butter without any oil or sugar. Anyone else?